What Technology is Critical for Smaller Practices to Tackle MACRA? What Technology is Critical for Smaller Practices to Tackle MACRA? What Technology is Critical for Smaller Practices to Tackle MACRA? It’s no secret that healthcare has lagged behind other industries in technology adoption. It has taken a huge and expensive effort by the government to incentivize the industry to adopt EHRs. And for the most part, it has worked — but not everywhere. Many smaller practices are ill equipped to face new regulations like Medicare Access and CHIP Reauthorization Act of 2015 (MACRA). While overall adoption of complete EHRs has increased to around 60 percent, according to the latest report from SK&A, it is much higher in larger facilities and hospital- or health system-owned practices. The smaller the practice, the less likely they are to have an EHR. Only 50 percent of solo doctors have an EHR, while nearly 80 percent of practices with 11 or more providers have an EHR. Further, independent practices that are not owned by a hospital or health system are also less likely to have an EHR. At the same time, solo and small practice physicians responding to a recent Black Book survey stated their concerns about meeting changing government-led reimbursement structures and regulations, such as MACRA. Ninety-one percent of physician practices anticipate declining to negative profitability due to diminishing reimbursements and underutilized or inefficient billing and records technology. Over two-thirds of all practices agree their billing and collections systems/processes need upgrading. Of those who responded, most said they were looking to upgrade and integrate technology, bringing together practice management, revenue cycle management, and the EHR to be more successful. There was a time when adopting technology in healthcare was a very expensive enterprise. One study from five years ago showed that back then, for a five-doctor practice, a server-based EHR would cost $233,000 just for the first year. And, that was just for the EHR. There could easily be separate costs, including setup and implementation for a billing and scheduling system. So it makes sense that six in ten physicians who were not adopting an EHR cited lack of resources as their main reason. However, a lot has changed in the last few years, and there is a misperception among smaller practices around the cost and complexity involved in health IT. Technology is now more integrated, affordable, and easier to install and maintain. In addition, for those not poised on the edge of retirement, paper simply isn’t going to work in the new healthcare reimbursement environment. This is largely because MACRA will focus more on the use of technology, reporting patient outcomes and interoperability. Current programs like PQRS and Meaningful Use will still exist in some form as part of MACRA and there will be an increased push towards accountable care and value-based reimbursement. With MACRA coming in 2017, practices should look to add or upgrade technology. Here are some suggestions on what to look for and how to keep costs in check. • Look for an integrated platform with a single patient database. • Consider cloud-based software, which is easier to implement and maintain. • Choose a solution that offers native mobile applications for easy access from your iPhone or iPad. • Opt for a low cost, subscription-based software, which is generally more affordable with less commitment on your part. • Ask about the types of engagement features patients are looking for like online scheduling, text reminders, patient portal, and follow up communications. Once you choose a system, make sure you maximize efficiency by taking advantage of all the training and support offered by your vendor. Use all of the options for favorites and shortcuts to save time and prevent task fatigue. While MACRA may be a challenge, it also offers a huge opportunity. For those who are well prepared, the incentives can be significant, at over a 25 percent increase in Medicare payments. 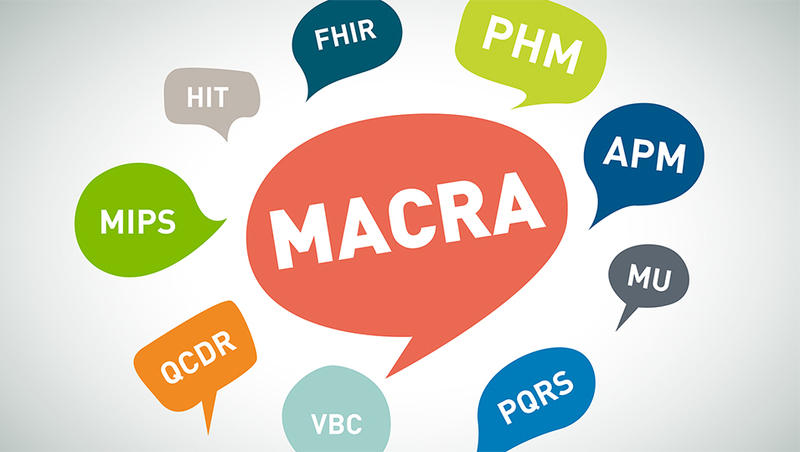 It’s important to talk to your vendor specifically about how they can support you in preparing for MACRA, specifically asking what additional training or resources specific to MACRA they will offer. There are many opportunities to exceed 100 percent reimbursement in 2019 based on your 2017 performance. It always takes time to adapt to new technology. That’s why it is so important to consider any changes now. The importance of having the right solutions in place will only increase and become more critical as the MACRA era begins in 2017.